Originally from Normal, IL, twenty seven year-old saxophonist-composer Adam Larson, endorsed artist for P. Mauriat saxophones, D’Addario Woodwinds, Lebayle and Bari mouthpieces, began playing saxophone at the age of 11. As a high school student, Larson was a member of virtually every national program dedicated to showcasing excellence in young jazz talent including The Grammy Band, Next Generation Jazz Orchestra, Betty Carter Jazz Ahead, YoungArts Jazz Fellows, Telluride Student All-Stars, Jazz Band of America and many others. Described by critic Howard Reich of The Chicago-Tribune as “a player for whom the word ‘prodigious’ was coined”, by Peter Hum of the Ottawa Citizen as “a saxophonist who brings Donny McCaslin and Mark Turner to mind”, and by Nate Chinen of The New York Times as “a self-assured young saxophonist”, Larson has garnered numerous awards that distinguish him as one of the most promising artists of his generation. 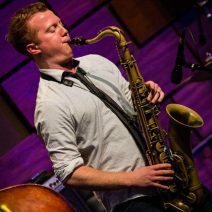 Upon completion of his Bachelors degree at The Manhattan School of Music in May of 2012, Larson was selected as a member of the inaugural Manhattan School of Music Jazz Institute to continue his studies as a Master’s student, where he graduated with honors as the recipient of the William H. Borden Award for Outstanding performance in Jazz Performance in 2014. With three records under his belt, Larson’s latest, entitled “Selective Amnesia”, was released on the Inner Circle Music Label (created by famed Alto saxophonist Greg Osby) and was featured in the New York Times, Downbeat, Saxophone Journal and several other publications in print and online. Larson keeps an active schedule with his quintet and as a sideman, having performed at several venues across the U.S. including Birdland, The 55 Bar, The Jazz Gallery, The Blue Note, The Village Vanguard, Smalls, Cornelia St. Café, The Kitano, Dizzy’s Club-Coca Cola Jazz at The Bistro, The Jazz Showcase, and several others. As a sideman, Adam has performed with numerous groups including Jamie Cullum, Ted Rosenthal, The Ari Hoenig Nonet, The Vanguard Jazz Orchestra, Otis Brown III Band, Michael Rodriguez Quintet, and Helen Sung Quartet. Adam has been a part of several tours that have allowed him to see more of the world than he once thought possible. Larson’s quartet was selected as one of ten ensembles to tour on behalf of the U.S. State Department’s “American Music Abroad” program and toured Africa for 35 days in April 2015, visiting The Democratic Republic of Congo, Senegal, Benin and Ghana. Larson has also toured India, Taiwan, Holland, and Germany as well much of the United States.